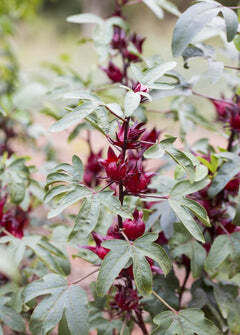 Fresh Hibiscus Fruit goes by many names: Jamaican Sorrell, Fleur de Jamaica or Roselle. But our favorite is Florida Cranberry, named by the old Florida homesteaders who grew this plant abundantly. Florida Cranberry fruit, which is actually the calyx of the hibiscus flower, has a tart cranberry like flavor with the texture of an apple. The fruit can be eaten fresh, used fresh or dehydrated for teas and fruit leather, distilled, fermented into beer and wine, used in marinades, or made into juice, jam, syrup, jelly, etc. It can even be used to make soap, beauty products, or natural dies. The possibilities are endless! Petals are peeled from the seedpod like an orange, or plucked out with an olive corer before use. However, the seed pods are also valuable! They are rich in natural pectin and in Vitamin E and can be very handy when making jam and jelly.